If there's one universal truth in life, it's got to be this. We all wonder what lies beyond the grave. Is it the end of our existence or is it the beginning of an eternal bliss? Is it something to be fearful of, or is it something to look forward to? And even though most people seem to be in the dark on this, one thing is for sure, One Minute Into Eternity, you'll find out. 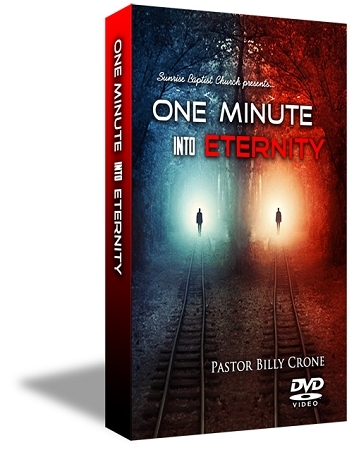 Therefore, in order to prepare you for eternity before it's too late, this study, One Minute Into Eternity takes a look at the four basic questions concerning eternal matters. "Is There Life After Death?" "What Happens When You Die?" "Is There Really a Hell?" and "Is There Really a Heaven?". As you will discover, there are only two options. It's either up, or it's down. Each of us are currently headed for eternal bliss in heaven or eternal torment in hell. Scoff all you want, but once you've gone, there is no coming back and there is no second chance. Please reach out and give your life to Jesus Christ today because One Minute Into Eternity, it's going to be too late.